Better data management, consistency, and communication: three concepts to unite safety and access, multiplying productivity for all parties. An intricate weaving of wires to the untrained eye, power lines, telephone lines, CATV lines, fiber, and other cables line our residential streets. While most people see them daily, many do not realize the complex process, dangers, and time needed to repair or add attachments to these important field assets. Field technicians who work on utility poles are certified, often following years of training and apprenticeships. The work is dangerous, since power lines carry high voltages. It’s not only field techs that are concerned about safety. Assets owners are cautious too and such diligence can, in practice, limit pole access for potential attachers and vault access for potential occupants. This impacts the local community, area residents, and would-be attachers/occupants, since new services cannot always be quickly deployed. Further, the more attachments there are on a pole, or occupants in a conduit vault, the greater the safety risk for technicians. 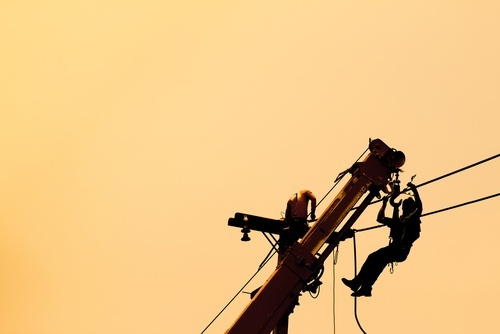 Today’s utility infrastructure has become increasingly flooded with attachment and transfer requests, as companies race to deploy the newest technologies. One of the primary issues today is to find the balance between improving safety and encouraging access. Companies have the responsibility to be safe and timely. Therein lies the challenge. An extensive amount of data is needed to operate, maintain, and manage field assets. To improve efficiency and accuracy, thereby improving safety, asset owners and attachers must be able to deliver actionable, high quality, and timely information to the key stakeholders who need the data. Better data management means that information would be delivered to persons in any job related to the asset, in a format that suits his or her job function. Relevant asset data has to be easily accessible to all relevant parties. Depending on the job function or role, this data may range from an asset’s location, size, age, ownership, attachments, maintenance history, photographs, or measurements from past field visits. The California Public Utilities Commission (CPUC) recently held a “Workshop on Pole and Conduit Databases & Applications” to discuss strategies for promoting competition among providers, while ensuring equal access to attachers across more than four million poles in California. In her welcoming statement, Elizaveta Malashenko, Director of the Safety and Enforcement Division, explained: “If we have good governance and good processes for maintenance, how access is granted and how conditions are monitored, it can improve both safety and access.” If such principals are carried out, this would direct clear and concise action to all parties involved in attaching, repairing, and maintaining these assets. Further, such actions would promote safety, while simultaneously opening access to poles and vaults. Implementing a centralized, shared asset database benefits all parties and simplifies communication. Shared data helps track compliance, aids enforcement of local, State and FCC regulations, supports investigations and advising responses to complaints, tracks trends, and monitors safety risks (such as utility poles in high risk areas, like fire zones). All these positive attributes streamline communication within and between multiple departments, groups, and businesses. Learn more about how a centralized, shared asset database can help improve asset safety and access. Schedule a consultation with an Alden asset management expert. Since 1995, Alden has partnered with companies that power, inform, and connect our nation. We offer software and services to the electric power, broadband, and telecommunications industries. Our goal is to unify the joint use community, offer expert insight over essential infrastructure assets, and provide our clients clarity and control. Our software and services empower joint use companies to work together with simplicity. © Copyright 2019 Alden Systems, Inc., Reg. U.S. Pat & TM Office.